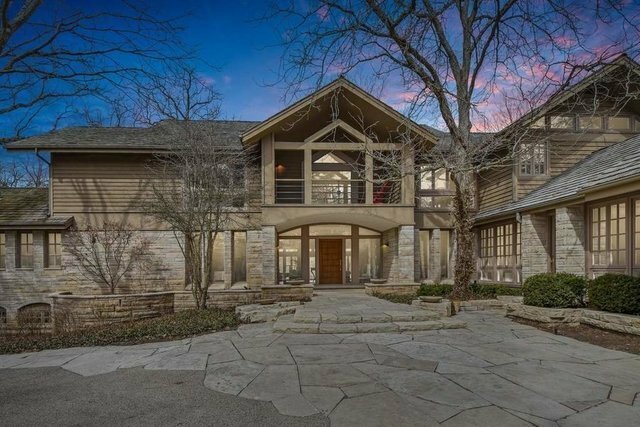 This remarkable Barrington Hills WATERFRONT home is set on a private lane w/over 5 acres of professionally landscaped grounds. This home was designed to take advantage of stunning views in every direction. Large gracious rooms throughout the home, w/almost all rooms featuring a lake view. The 2-story sun drenched foyer embraces you from the moment you step inside w/captivating lake views! Vaulted great rm w/fireplace & French doors to patio says'relax, you're home'. 1st flr boasts an incredible lux master suite; office; spacious white eat-in kitchen w/vaulted breakfast rm; circular sun rm w/radiant heated flrs; large mud rm; 10 ft ceilings w/8 ft doorways T/O! Addl. 4 bedrooms/3 full baths on 2nd level w/dual staircases. Full finished English LL is ideal for gatherings or entertaining offering a rec rm, full bar, media rm, fitness rm/full bath, wine cellar & large finished storage rm! 4 car heated garage! Plus a separate guest cottage! Cottage features a full kit & bath, FP & loft!